Oh is it nice to potato out on the couch with a cup of tea, the cat, chocolate covered cookies, and High Society on TV. I've already lost the race to get my LFW shots up first, so I can now take my time and send them out into the world, along with whatever I shoot next, in whatever random order hits me. 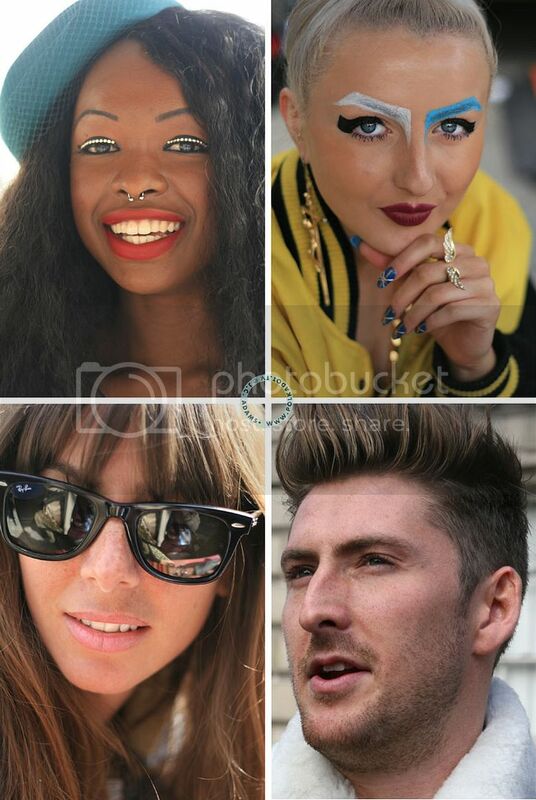 Clockwise from top left: a girl whose name I forget, Rihanna, Henry Holland, and Natayla. You may say this post has nothing to do with 'style' and you're probably right. Except I happen to feel that our personal style comes from something close to our soul. And with that regard, our eyes are the window to that above mentioned, elusive soul. This weekend we saw a great show, still on, at the Tate Modern called Exposed: Voyeurism, Surveillance and the Camera. It's a subject I'm fascinated with, because - as more and more bloggers are shooting 'street style' especially at fashion weeks, and as I push my creative envelope in other directions (hence the alternate blog name - I'm no longer just street style) and as I shoot the occasional celebrity, I'm aware of trying to find a balance between portraiture, privacy, exploitation, and simply the concept of fame. I wanted to call this title 'don't you know who i am?' but then I spent ages trying to find this quote.. something about 'we had faces'.. couldn't recall which film is was from but it's probably Sunset Boulevard, which led me to this hilarious little sketch, below. No offence, Hillary: we're not laughing at you, we're laughing with you. You're right, when more people are shooting streetstyle we will constantly see the same outfit on every blog. Maybe shooting famous people is the quickest way to get famous, and fame is something everyone longs for. How sad and how cute it is. Really love what you write. Thank you, Jin, Pearl. It's been such a difference experience for me, this third of the fashion weeks: last September I was a sponge, quietly observing, shooting, meeting people... this time I was more in the shows and I was watching these little clones of me, doing what I did last year with the same zest and enthusiasm.. it was quite sweet, actually. I felt like one of those fat lazy cats watching kittens happily playing with string and thinking, yes. That is the natural order of things. I'll never stop, tho: every time I'm out, on the few times I don't have my camera with me.. it's in the blood now. But at fashion week, I often found I'd set up someone for a shot, quickly choosing the right background, and suddenly there would be six other bloggers surrounding me, stealing my shot. It's still lovely tho. But I know what you mean, Jin: it really opens an interesting conversation as to what the nature of fame is, and why we'd want it. I am intrigued by your statement that you are trying to find a balance between portraiture, privacy, exploitation and the concept of fame. Would you elaborate on that a bit? What do you mean? Hope you don't mind. Don't mind in the least, PD. I just wrote what I felt was quite, for me, an intelligent, thoughtful, and thought provoking reply.. asked you some good questions, too, about the nature of your photography.. and lost it forever. Been trying several times to post a comment, if I'M having problems I dread to think what innocent people trying to comment are going thru. Must run out but will try again later, but chances are, those pearls of wisdom are gone not to return again for sometime soon. Here goes... Blogger please don't fail me now! Has it only been a year? Yeah, I remember your posts from last years' LFW. Loved them. So now you're a fat cat, lucky kitty! I absolutely love street style photography, so can't ever get enough. your potrait photos are so great!